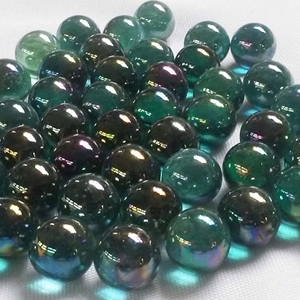 These transparent emerald green marbles have an oily reflective surface and make beautiful decorative marbles. These marbles are sold in pound quantities, with approximately 100- 120 marbles in a pound. If you need larger bulk quantities, call for pricing and availability, 1-888-410-0680. Sizes may vary slightly. Warning! : Choking Hazard. This toy is a marble. Not recommended for children under 5 years.